OS grid reference SS 4209 8982. About one and half miles north-east of Rhossili village at the far western-side of the Gower Peninsula – and at the bottom of the eastern scarp of Rhossili Downs – are two ‘former’ portal burial chambers (dolmens), standing around 100 metres (330 feet) apart, and called Sweyne’s Howes or ‘Sweyne’s How’, ‘Swain Houses’ and also ‘Sweye’s Houses’. The place-name Howes or How means or refers to burial mounds or tumuli. Sweyne was the name of a Scandinavian warlord who lived and died in this area in the 11th century, but the megalithic monuments pre-date him by three thousand years or more. However the chambers (north and south) are now in a poor condition, the northern chamber being the best preserved of the two. Both burial chambers can be reached on footpaths heading north from Rhossili, close to the often windswept Gower coastline. The village of Llangennith lies 3 miles to the north-east, while the city of Swansea is 17 miles to the east on the A4418. The northern burial chamber or dolmen stands upon an oval-shaped mound which is a cairn measuring roughly 60 feet by 42 feet though it is now in a ruinous condition – as is the chamber. However it’s condition is resonable. Two upright slabs support a capstone that has slipped down on it’s side and, in the middle, there is a fallen upright stone and a smaller recumbant stone. It’s portal has gone. There are slight traces of a kerb and also a few outer stones still (in situ) stand close by. 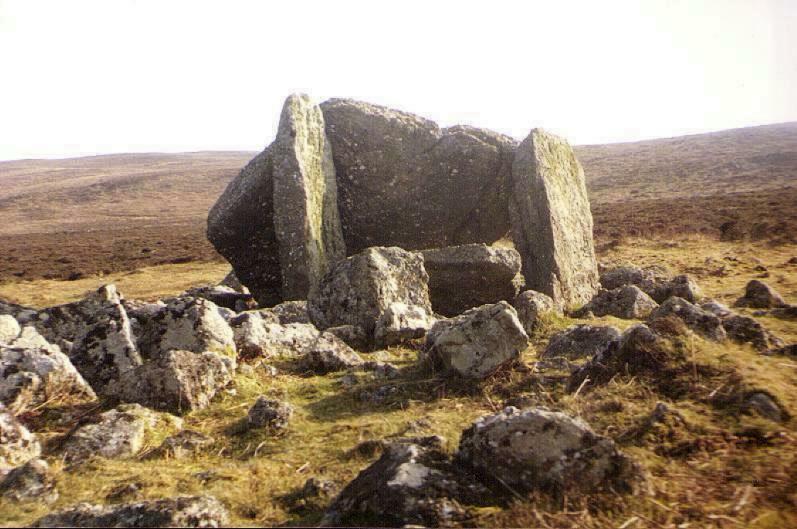 The south burial chamber of Sweyne’s Howes at Os grid reference SS4205 8976 has been largerly robbed away. It’s alomost circular burial mound with a very damaged and jumbled arrangement of stones that make up the cairn measures 70 feet by 50 feet. Nothing much remains of the burial chamber, sadly. The large capstone now lies flat though two of the uprights ‘still’ stand on their own beside it. Both monuments date back at least 5,000 years to the Neolithic period of prehistory 2,000-3,000 years BC. Sweyne or Swain, was according to legend, a Scandinavian warlord of the early 11th century AD. He was probably the founder of Swansea (Sweyn’s-ey) but he came to live on the western side of the Gower Peninsula and died there. Whether he was buried in one if the mounds that make up Sweyne’s Howes we do not know. It seems most unlikely because these two monuments pre-date him by several thousand years. But there was apparently a king of that name who died in south Wales about c 1014 AD, so there could be some truth in the story. There are other numerous prehistoric monuments in the vicinty of Rhossili Downs, dating from the Bronze-Age to the Iron-Age, that are worth exploring, including cairns, round barrows and a ring-fort. The Gower Society, A Guide To Gower, Gower Society Publications, 1989. Houlder, Christopher, Wales: An Archaeological Guide, Faber And Faber Limited, London, 1978. The National Trust, The Gower Peninsula (An illustrated souvenir), 1991. Categories: Burial Chambers / Cromlech / Dolmens, Sweyne's Howes near Rhossili in Gower South Wales | Tags: Sweyne's Howes near Rhossili in Gower South Wales | Permalink.